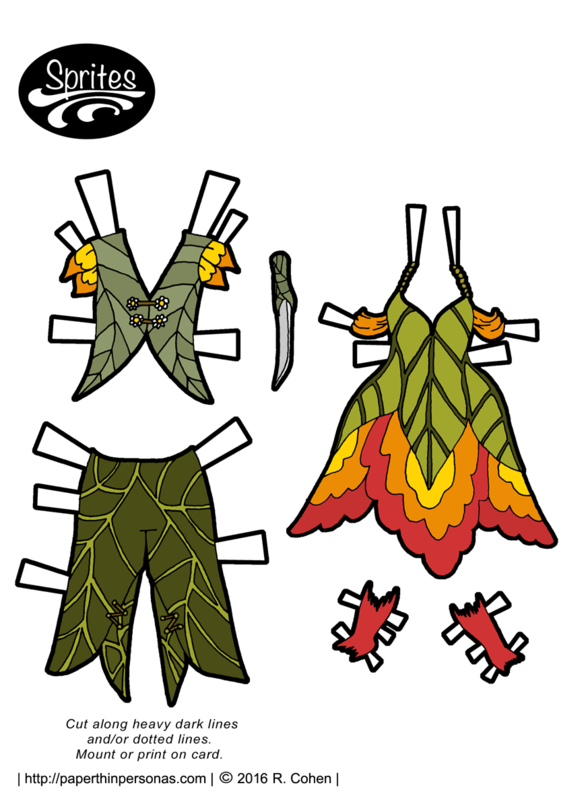 A few weeks ago, I posted my flower fairy outfits for the Sprite paper dolls inspired by nasturtiums. At the time, my two Sprite fairy paper dolls weren’t done yet, but now they are. So, today Yumiko of the Sprites paper doll family today is showing off her fairy side. Tomorrow, her male partner in crime Xavier will make his fairy debut. Even with this new format, I do plan to post Sprites as sets. I like having a lady and a gent of the same theme posting two days in a row. I think it is fun. And it is my blog, so I get to decide what is fun here. All of my flower fairy designs owe something to Cicely Mary Barker who illustrated what are now “classic” flower fairy illustrations starting in the 1920s. Here are some of her fairy illustrations. There is something so innocent about Cicely Mary Barker’s art. I still really love her books and I loved them when I was a child. My favorite was the Willow Fairy. Of course, the book Fairie-ality was also a big influence. Highly recommended. I went back and forth and back and forth about the color scheme for this one. I tried out blue skin and green skin, but I really like how the purple turned out. If you think she needs a different color, then there’s always the black and white version. So, here’s my question for my readers today, was I the only Cicely Mary Barker flower fairy fan as a child? Let me know in a comment! And if you like the blog, and want to see what goes on the behind the scenes, then join us on Patreon. 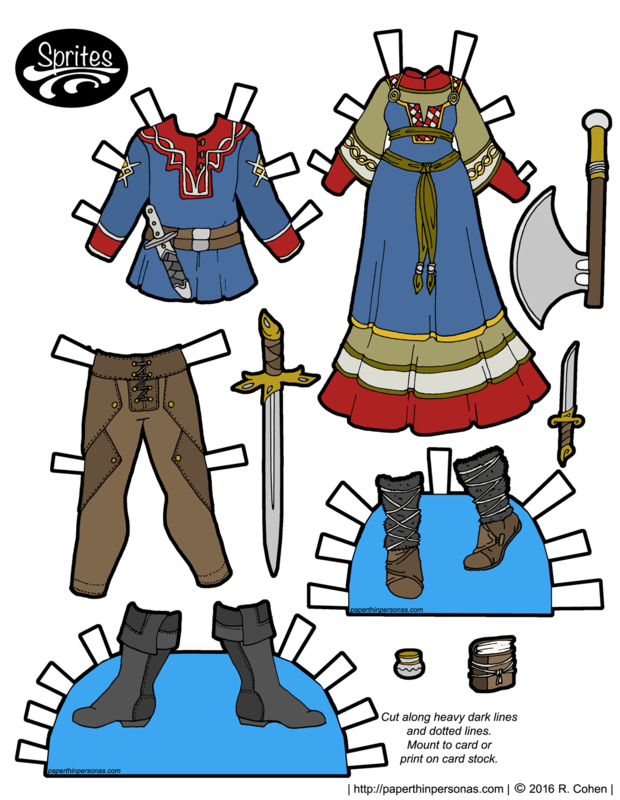 A dollar a month gets you access to the Behind the Scenes blog and five dollars gets you the Vivian Paper Doll Project. 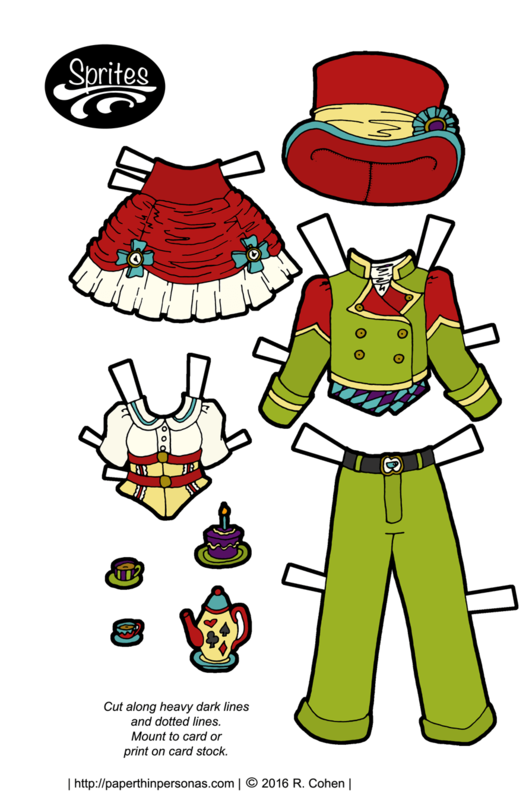 Right now, my patrons are voting on a name for a new Marisole Monday and Friends paper doll. Sprites: Flower Fairies Can Be Boys! 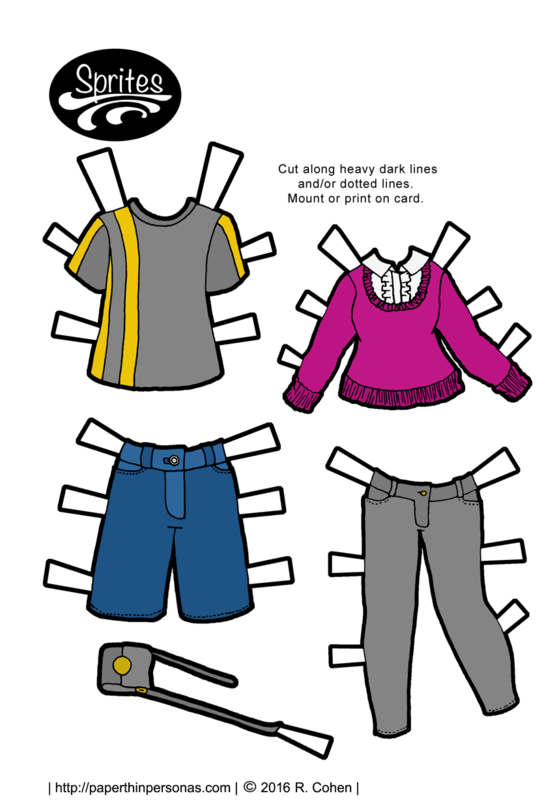 Here today we have flower fairy clothing for both boy and girl paper dolls. I also have fairy versions of two Sprites dolls in the works, but they aren’t ready for prime time yet, unlike my flower fairy outfits. So, I own a lot of serious costume history books and I own a lot of books of fairy tales and folklore. I own only one book that combines the two. That is Fairie-Ality, an amazing collection of fairy outfits made from natural materials and beautifully photographed. It is a book I use when I am looking for fairy inspiration. Other than that, this set of fairy paper doll clothing was inspired by Nasturtiums. I love Nasturtiums, because they taste spicy and they grow best in poor soil. Anyway, they are most often yellow, orange or red flowers, hence the yellow, orange and red color scheme. If you want to support the blog, than consider becoming a Patron, it’s fun and mostly painless, I promise. So, my question for all my readers today is, what is your favorite flower? I confess nasturtiums are some of my favorites. Let me know in a comment! Alice and the Mad Hatter are preparing to celebrate an Unbirthday today it seems! Now, one of the fun things about their clothing is that it is mix and match. Personally, I would pair Alice’s skirt with her top from Wednesday. Yesterday’s green bowler hat would go great with the Mad Hatter’s green suit today. Frankly, I hadn’t really thought much about outfits when I was drawing this set, so I had to try to make things cohesive with the colors. I’m not sure that worked great, but I’m still learning how to make this new format work. Meanwhile, back at the ranch, I’m not sure what next week will bring. I may need a hiatus for a few weeks as I move and deal with some other stuff. I haven’t decided yet, but I will let y’all know as soon as I do. As always, I’d love to hear that people think of the theme this week! Well, my friends, it is Accessory Thursday! And today, we have shoes and hats for Alice and the Mad hatter. 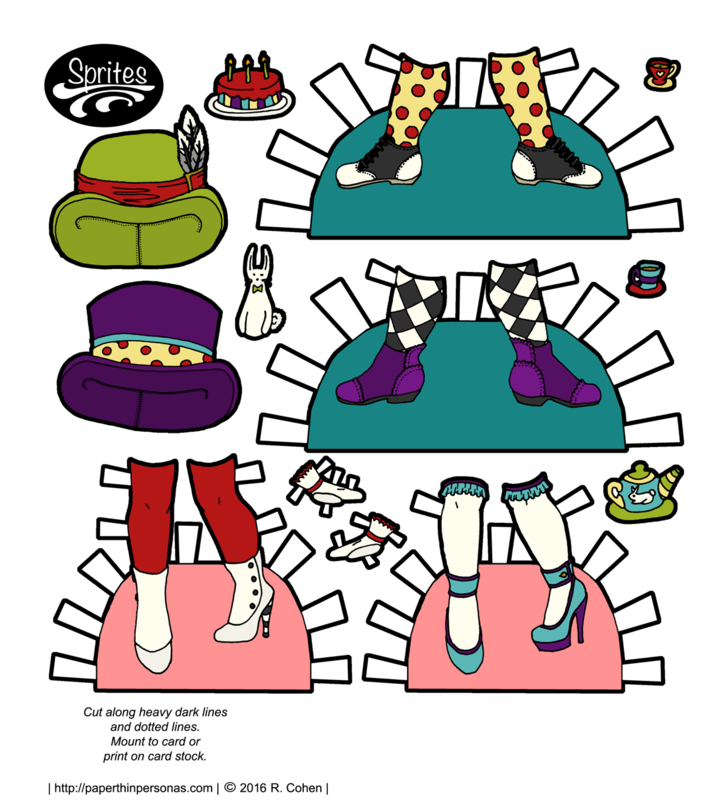 I had a great deal of fun designing sock patterns for the Mad Hatter and shoes for them both. Designing hats was also fun, but I need to get better at drawing top hats. Still, you get better by practicing, so I got in a lot of practice with this week’s sets. If you missed the dolls, here is Alice and here is the Mad Hatter. Shoes with a pink base are for Alice and the teal based ones are for the Mad Hatter. I’d think that would be obvious based on the leg poses, but I thought I should clarify in case there was any confusion. If you’re a lover of the blog, then please considering supporting it on Patreon, plus there’s an extra outfit for my Patrons this week and who doesn’t want some of that? And, as always, I love to hear what y’all think, so comments are always appreciated. I tried to pick out motifs from the book that made sense to make into clothing patterns. The black and white checkerboard pattern recalls a chess board. 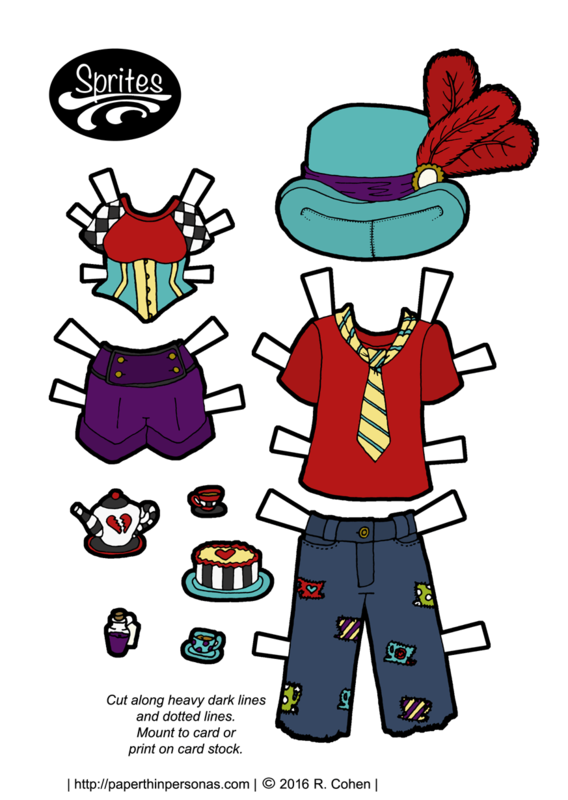 The cups and saucers are some of the best accessories I can think of for a Alice in Wonderland themed paper doll set. I also added hearts, roses and other symbols that make me think of the books. On the left is an outfit for Alice from Monday including shorts and a underbust corset over a t-shirt. For the Mad Hatter from yesterday, there is a t-shirt and shorts with patched shaped like tea cups, though the fact they are shaped like tea cups might not be immediately obvious. The black and white version is linked at the top of the post, as usual. I’ve been working on making sure new content announcements are going up regularly on Twitter. Also, if you like the blog, then support it on Patreon. I’m going to be moving in the next few weeks, so the blog may go on haitus for a few weeks. I just don’t know yet. So, baring in mind those moving parts, I thought I should give people heads up.